Your Rhino account provides a single way to use and manage everything McNeel. You can associate your Rhino licenses (and those of other compatible plugins), participate in our discussion forum, and use other first and third party services using the same account––even if your email addresses or linked accounts change at some point in time. Rhino Accounts is designed to be secure from the very beginning, and we are continuously improving the security and stability of the system. Creating a Rhino account is easy and free. Warning If you already created a Rhino account before, you should use it instead of creating a new account. Your new account will not have any services or licenses associated with it. See recover your account if you are having trouble logging in to your existing account. Go to the Create an Account page. If you’d like to link an account, click on the appropriate button. Otherwise click on No Thanks. Fill out required information, if any. Using a linked account, such as Google or Facebook, means that you won’t have to use a password or setup any account information. If you choose to use a password, you will need to verify your email address by clicking on a link in an email we will send you after creating your account. If you are unable to login to your Rhino account, it is possible for us to send you an email containing tailored information on how to recover your account. If you login using a linked account, the email will contain information on which account you should use to login. If you login using a password, you will have the opportunity to reset your password by clicking on a link in the email. Go to the Recover Your Account page. Type in any email address associated with your Rhino account in the Email field. Click Continue or press the return ⏎ key. Tip If you type your password incorrectly repeatedly over a short period of time, you may see the message "This account is temporarily locked out. Please try again later." You may have to wait up to 24 hours––even if you reset your password––before you can login again. In addition, if your account has Two-Factor Auth enabled, you will still need to provide the TOTP code to login. If you do not have a device that generates this code anymore, please contact our support team. Deleting your account permanently removes all data related to your account from Rhino Accounts. Danger Do not delete your account unless you are absolutely sure you have no licenses or services associated with it that you would like to use in the future. Access to any product or service will be terminated immediately upon account deletion. Never delete your account attempting to fix an issue with a product or service unless you have been specifically told to do so by a McNeel technician. Go to the Delete Account page. Read any warning messages carefully. If you are unsure whether you want to delete your account, you probably should not. Contact our support team for help. Identify the account you want to keep. This account is the one that has all services and products associated with it. In this example, it would be account A.
Login to the account you don't want to keep. In this case, it would be account B.
Delete account B. This will free up any linked accounts and email addresses associated with it. If both accounts have some service or product associated with it, you will need to transfer these from account B to account A before you proceed any further. For example, if both accounts have licenses in Cloud Zoo, you will need to remove all licenses in account B and add them to account A. Type your email address in the Email field. If the field is not visible, click on Other Login Options. Click the button or press the return ⏎ key. Click on the colored button that appears in the middle of the screen. Enter your Rhino account's password . Enter the TOTP code from your secondary device. Tip If you type your password incorrectly repeatedly over a short period of time, you may see the message "This account is temporarily locked out. Please try again later." You may have to wait up to 24 hours––even if you reset your password––before you can login again. Tip If you are on your personal device, make sure to check Keep me signed in. This will keep you logged in to your Rhino account even if you close your web browser or restart your device. Never check this option if you are on a public computer. To manage emails associated with your account, go to the Emails page. You can add or remove email addresses from this page. Tip Your Rhino account can be associated with as many email addresses as you own as long as they have not been taken by another Rhino account. If you have accidentally made more than one Rhino account and would like to consolidate them, see merge accounts. To manage linked accounts, such as Facebook and Google accounts associated with your account, go to the Linked Accounts page. You can add or remove linked accounts from this page. Tip Associating one or more linked accounts to your Rhino Account allows you to simplify the login process by not requiring you to store or remember a password for your Rhino Account. Also note that the Two-Factor Auth feature will be bypassed if logging in with a linked account. Go to the Change Password page. Enter your current password, if any. If you created your Rhino account with a linked account, your Rhino account may not have a password set. In this case you will not be asked to enter your current password. Two Factor Authentication, also known as Two Step Authentication, provides an optional layer of security when logging in to your account. You can choose to require two factor authentication every time you login to your Rhino account, or only when you login from a new device. Warning If you login using a linked account, two factor authentication will be bypassed. Go to the Two-Factor Auth page. Follow the instructions to enable or disable the system. You can update personal information associated with your account at any time. To change email addresses and/or linked accounts, see Account Emails and Linked Accounts, respectively. Your personal information is kept safe in Rhino Accounts and is not shared with any third parties unless you give explicit permiission to do so. Tip Some services that use Rhino Accounts cache your personal information. You may need to logout and login again on such services so they reflect the updated information. Go to the Personal Info page. Choose a source for your new profile picture. If you have linked accounts, such as Google or Facebook, you may have additional sources to choose from. Update your name in the Name field. Update your phone number in the Phone Number field. Update your language in the Preferred Language field. Tip The Rhino Accounts website will be displayed in your device’s language, however, communication via text or email will take place in the language you choose here. Update your country in the Country field. Teams allow you to associate two or more Rhino accounts into a collaborative entity to share resources, such as Rhino licenses. Anyone can create a team in seconds. There are two ways to add additional team members, either by sending them an invite, or in large organizations, by linking your team to a domain. You can view which teams you belong to and view your role in each of them at a glance. To view your teams, go to the Teams page. Tip You can click on any team to view more information, including its members. Go to the Teams page. Click Create a New Team. Tip A lonely team is no fun. 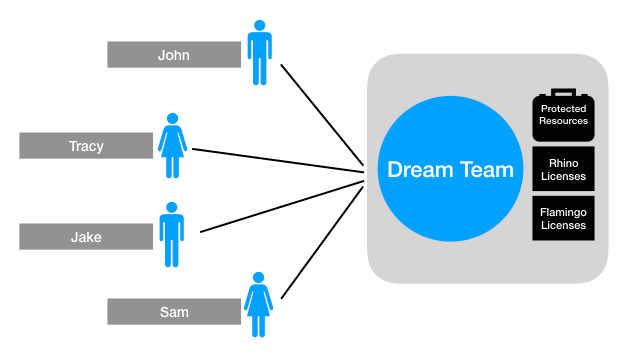 You can invite users or link your team to a domain immediately upon team creation. Click on the team whose members you wish to see. Scroll down to view the team members. You can sort columns and use the arrow keys ← → to scroll through the list. Warning Leaving a team will prevent you from using any of the team’s resources, such as any licenses associated with it. Click on the team you wish to leave. Click on the Action button at the bottom of the page. If you are an Owner or an Admin of a team, you can perform all the administrative tasks listed below. By default, a newly created team only includes one member: its owner. To have additional users join your team, you must send them an invite via email as explained below. The email addresses need not be associated with an existing Rhino account––the invitees will have the option to create a Rhino account if they do not already have one. Click on the desired team. Choose the Language the invites will be sent in. Type or paste the email addresses of the invitees. Review the email addresses the invites will be sent to. Warning If the team is linked to a domain and the user’s email addresses belongs to said domain, the user will be given the option to be added again the next time they login. You will need to remove the user from your domain in order to effectively remove him or her from the team. Click on the user to remove. Click on the user whose role is to be modified. Select the appropriate role for the user. Linking a Rhino Accounts team to a domain is useful in large or complex organizations. What happens when a Rhino Accounts team is linked to a domain? Join the team, drop any email addresses not related to the domain, and adopt the team’s login method. Relinquish any email addresses associated with the domain and decline joining the team. Any new users who try to login using an email address associated with the domain will have a Rhino account transparently created for them the first time they successfully login using the team's login method. They will also be added to the team without the need for an invite. If new users try to login or create an account using a different login method, they will be guided to login using the team's login method. New or existing accounts that have an email address associated with the domain may not add other email addresses or linked accounts, and their linked account must match the team’s login policy. It is still possible for team administrators to invite users manually even in a domain-linked team. This allows for special users that are not associated with the domain to become team members. Why link a team to a domain? Users who have email addresses associated with the domain will be added to the team without the need to create an account and explicitly accept an invitation. IT administrators can use their own user management tools such as onelogin, Azure Active Directory, Google for Work etc… to manage team members. For example, an administrator can create an Active Directory group that contains the only members who are allowed to login to Rhino Accounts. Similarly, removing a user from that group effectively restricts that user from using their Rhino account. How do you link a team to a domain? Click on Link Domain to Team. Type a domain name that you own. Make sure it is the root domain (i.e. rhino3d.com and not www.rhino3d.com) unless your email server purposefully uses a subdomain. Place the specified file at the specified location in your domain’s HTTP server. Make sure it can be publically accessed. Go to the Azure Portal, and login to the desired directory. Click on the Azure Active Directory blade. For Name, enter something like Rhinoceros or Rhino 3D. For Application type, select Web app / API. For Sign-on URL, enter https://accounts.rhino3d.com. Once the application is created, copy the Application ID value shown and paste it into the Client/App ID field in Rhino Accounts. Search for the oauth2AllowImplicitFlow field. If it is set to false, change it to true. Search for the replyUrls field, and replace the current value in it with the Redirect URI shown in Rhino Accounts. Search for the identifierUris field, and copy the host of the uri provided. For example, if https://test.onmicrosoft.com/ddc2a0a4 is shown, copy test.onmicrosoft.com. Save changes to the manifest. Back in Rhino Accounts, paste the host you copied from the identifierUris field into the Endpoint field. Go to onelogin, and login to the desired domain. Hover over the Apps button. For the connector name, enter something like Rhinoceros or Rhino 3D. For Sign on Method, select OpenID Connect. For Redirect URI, enter the Redirect URI shown in Rhino Accounts. For Login URL, enter https://accounts.rhino3d.com. Once the connector is created, hover over More Actions then click Add App to Connector. Once the app is created, click on SSO. Copy the value shown in Client ID. Back in Rhino Accounts, paste the value into the into the Client/App ID field. Back in onelogin, copy the first subdomain of the uri provided in the Request URI Example. For instance, if https://test.onelogin.com/oidc/auth?... is shown, copy test. Back in Rhino Accounts, paste the value copied into the Endpoint field. Rhino accounts keeps all your information confidential by default. In order for any service or product (called app in this section) to access your account information, you must explicitly consent to do so. You can view which apps you have given permission to access some or all of your account information, and revoke these permissions at any time. Go to the Permissions page. Revoke an App’s Permission to Access your Account. Click on the app of interest. Tip To add or remove licenses from Cloud Zoo, see this page.